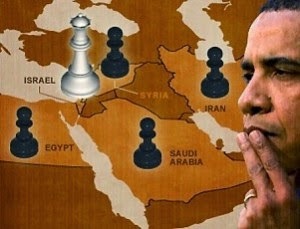 Yet, while the amendment was sold to the American people and even members of Congress as Obama’s plan to “detect and degrade” ISIS, the reality is that the plan is nothing more than a plan to detect and destroy the Syrian government to benefit of ISIS and other fundamentalist groups that the United States has created, funded, trained, and directed since the very beginning of the Syrian crisis. Even Congressman Justin Amash was able to recognize the fact that this new amendment was a clever disguise for a war on the secular government of Syria with no options off the table, including the use of ground troops. While Amash was correct to suggest that Congress should have opposed the amendment and that the amendment was actually a plan for an assault against the Syrian government as well as the fact that that anarchy, chaos, and unspeakable violence will reign supreme in Syria if the “appropriately vetted” groups managed to gain control of the country, Amash does miss part of the point. There never were any moderates to support in Syria to begin with. Western media outlets have also gone to great lengths to spin the fact that ISIS is operating in both Syria and Iraq with an alarming number of American weapons and equipment. As Business Insiderstated, “The report [study by the London-based small arms research organization Conflict Armament Research] said the jihadists disposed of ‘significant quantities’ of US-made small arms including M16 assault rifles and included photos showing the markings ‘Property of US Govt.’” The article also acknowledged that a large number of the weapons used by ISIS were provided by Saudi Arabia, a close American ally. Even as the U.S. House was debating whether or not to pass token legislation to passively allow the Obama administration to perpetrate yet another foreign war against a sovereign nation that poses no threat to the United States, rabid warmonger John McCain was grilling Secretary of State John Kerry in what amounted to nothing more than some mildly entertaining D.C. theatre. 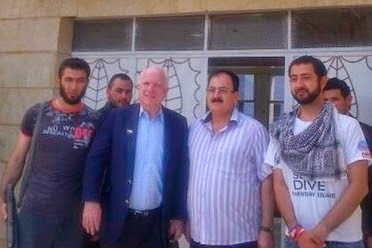 McCain’s position is not surprising considering the fact that he apparently has a close relationship with al-Qaeda, ISIS, and its affiliates. 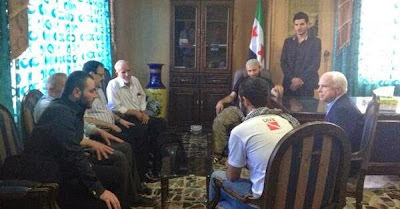 After all, it was McCain who was photographed in a meeting with Salem Idriss, the leader of the Free Syrian Army and Abu Bakr al-Baghdadi, the head of Al-Qaeda in Iraq and ISIS. 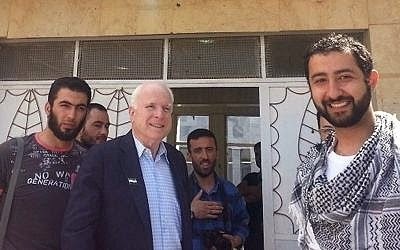 Remember also that McCain was photographed cavorting around with Abu Bakr, the “moderate rebel” who was seen cutting out a Syrian soldier’s heart and eating it for the camera. Such revelations, of course, will only be shocking news to those who have been unaware of thelevels to which the Saudis have been involved with the funding, training, and directing of death squad forces deployed in Syria. Indeed, the Saudis have even openly admitted to the Russian government that they do, in fact, a number of varied terrorist organizations across the world. 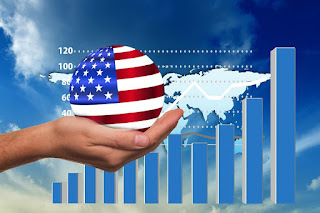 While the White House’s recent “plan” to “detect and degrade” ISIS is simply more of the same rhetoric covering the fact that NATO has been funding, arming, training, and directing ISIS and related organizations for the purpose of overthrowing Assad.